Between 2001 and 2003 consumers accumulated $1.1 trillion in new mortgages and consumer debt. The average American household receives at least 50 solicitations for credit each year, making access to credit easier than ever, even for high risk groups. Between 2000 and 2003 the number of non-business bankruptcies increased by 30%. Americans save an average of 1% of their income, while debt is at 100% over disposable income. Hypnosis has been found to turn individuals away from the trends that so many people have just accepted as a part of every day life. However, along with the “buy now pay later” attitude comes the stress of making ends meet when even the smallest financial upset comes into play – never mind a job loss or illness. Hypnosis opens the door to unlimited wealth by helping the participant relax, focus and become more motivated to go after the opportunities that bring about real wealth which is that balance between spending and saving. Hypnosis works by cultivating information and traits already present in the individual so that they can achieve their full potential. It is a method of clearing the clutter from thoughts and actions that can be crippling to ones efforts to better manage their finances or make job related decisions with confidence. The Unlimited Wealth Hypnosis MP3 download, a self-driven hypnosis therapy, was created by hypnotherapist Dr. Steve G. Jones and works to relax and then motivate you to reduce debt, increase savings, and potentially earn up to 400% more income. The game of money just like most things is a mental game. I, myself, used to have a big problem in believing that I was worth a certain amount of money. I thought I was worth $50 an hour when I first began seeing clients in my hypnotherapy practice. Luckily an older, wiser hypnotherapist sat me down and straightened me out. She explained to me that I was worth much more than that. I soon raised my rate to $100 an hour thinking that nobody would pay that much money. I was wrong – people gladly paid that much money; in fact I had more clients than ever before. She then suggested that I raise my rates to $150 an hour and I did and again I had more clients than ever before and that’s the way it has gone. The more I charge the more money I make. Now, why would that be the case? Do people want to pay more money for things? The answer is yes. People do. Because the more you charge, the higher their perception of your value goes. I eventually leveled off my price because I didn’t want to exclude certain people because of their inability to pay a premium price for my services. It is important to me to offer my services to as many people as possible yet to maintain the perception of value because I am offering exception value. However, I bring to light the story of my price increases to illustrate the idea that money is a mental game and once you begin believing that you are worth a certain amount of money that becomes reality. You send a signal to your subconscious mind and the world that you are worth X amount of money. For you, that amount of money which you perceive as your value may be low. This is the case for many people but once you change that perception to a higher number your world will also change to make that so. You may not run a business, I understand that, however even if you are working for an hourly wage and you decide that you are no longer worth $10 an hour and you are now worth $20 an hour your subconscious mind will find a way to make this your reality. Probably what will happen is that you will quit that job and seek a higher paying job, or you will acquire the skills necessary to be worth more. This could be in the form of more education or simply more training on the job. But your subconscious mind, rest assured, finds a way to make this your reality once you believe it. If you are in a sales position, this concept of believing in yourself and making more money is probably very familiar to you. If you happen to have a job in which your income is unlimited and it is directly dependant upon your purchaseivity in calling leads etc. then you know from experience that the more you believe in yourself the higher your income will be. So, your wealth is truly unlimited. So, I encourage you to change your life now with the help of hypnotherapy. Break down the barriers which you have in your mind because your mind is the only place which they exist. The boundaries which you have created are not real. They are simply assimilation and a compilation and a reflection of your collective experiences relating to money and your perception of your worth. The only difference between you and a billionaire is that the billionaire thinks like a billionaire. The billionaire expects to be rich. Think about this, how many people in America, for example, have taken advantage of the opportunity of unlimited wealth and have gone from rags to riches? They have created themselves to be millionaire when previously they were poor. So this concept of unlimited wealth is very simply. However, think about this also, many people who were poor have won the lottery only to find themselves poor again in a very short period of time. Why is that? Why do we find that consistently people who were poor and won the lottery return again to poverty? How can this be so? The reason is they have not prepared themselves for unlimited wealth. They have not done what you are about to do and taken the proper stems to reprogram their minds to think like millionaires or billionaires. The way a millionaire becomes a billionaire is thinking like a billionaire. The way you will become a millionaire or billionaire is by thinking like a millionaire or billionaire. Jim Rohn, a famous motivational speaker, says that if you get a million dollars you had better become a millionaire so that you can keep the money. What he means by this is that getting the money is not quite as important as believing that you are worthy of having that money. Don’t you just love those days when you are in a parking lot and you find a one dollar bill on the ground? It doesn’t seem to happen much anymore since everyone is using debit and credit cards. We all wish that money grew on trees, but it just doesn’t work that way. Although the word “wealth” seems to imply money, I believe the word wealth means so much more. I think for some people wealth means fortune. Other people might feel that wealth means fulfillment and abundance. Someone else might say that wealth means contributing to society. All of these definitions are true. The term wealth can mean whatever you want it to mean. I think that everyone should open up their mind, body, and soul to the idea of unlimited wealth. Everyone seeks different ways in which to feel fulfilled. Whether you are fulfilled by money, family, faith, or fame, you should strive for unlimited wealth. Unlimited wealth allows you to constantly strive to be the best you can be. If you open your eyes a little more, you will begin to notice different ways in which wealth can fill your life. You have control over your wealth. Ask yourself if there is a part of your life where you can make a change. Perhaps a career change would bring you more happiness and more income. Perhaps contributing to a cause will help you feel more fulfilled. I encourage you to keep an open mind, because when you keep an open mind, unlimited wealth will come your way. Dr. Steve G. Jones, Ed.D. takes you to the next level, puts the wind back in your sails, and gets you focused with the most powerful hypnosis wealth-building programming MP3. Steve G. Jones, Ed.D., Clinical Hypnotherapist, charges $1,500 for a custom recording and $25,000 for a one-hour private hypnotherapy session at his office. But you can get all the benefits for this low price. Simply listen to the Unlimited Wealth Hypnosis MP3 audio every night as you go to bed for three weeks and feel the changes happening in your life. You will feel more empowered, more in touch with your true self, and you will truly know that your goals are within your reach. You are unaffected by negativity and retain the ability to enjoy all of the warmth and joy that life has to offer. You are totally detached from negativity. You are open and receptive to love. You do not complain. You accept other people as they are and you do not expect them to change. You are patient, calm, and harmoniously centered at all times. You let go of all fear based emotions such as blame, jealously, guilt, and possessiveness. These negative emotions are now a part of your past and you open yourself, open yourself to receive all the good things life has to offer. You accept all good things into your life. You know that you are worthy of receiving all good things in your life. You allow yourself to receive good things. You do not block good things from entering your life. You are worthy of receiving them. You allow money to come to you. You allow money to come to you. You allow money to come to you. You now have a flow in your life and money is actually attracted to you and you allow it to come to you. You do not stand in the way of money flowing toward you. You allow it to come to you. You know it is for you. And you know that you will use it for the greatest good. You allow it to come to you. You now realize that you have the ability to create in your life unlimited wealth, unlimited wealth. Your wealth will be without limits. You allow money to flow to you and it does. It flows to you easily and effortlessly because you are now open and receptive to all good things. You keep your mind calm like water. You remain centered at all times. Physically relaxed, emotionally calm, mentally focused, and spiritually aware and money flows to you. You now realize that you will have unlimited wealth. You will have all the wealth you desire and you let this happen easily and effortlessly. You are comfortable with wealth. 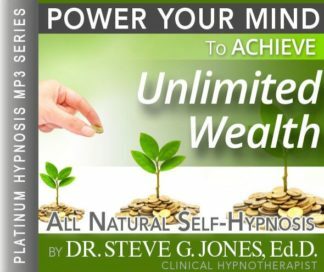 The Unlimited Wealth Hypnosis MP3 recording will help you achieve unlimited wealth in your life. This powerful hypnosis session will target your subconscious mind to no longer block you from gaining wealth in your life. You are a wealthy person. Now you just have to tap into your ability to achieve unlimited wealth. Using this self-hypnosis program will open up your world to new and unbelievable opportunities. Hypnosis puts you in charge of your future and gives you the ability to accumulate unlimited wealth. We suggest you listen to this Unlimited Wealth Hypnosis MP3 session for 21 nights in a row as you go to bed at night. You will begin to see changes in your life in as soon as the first session! After 21 nights, you will be well on your way to achieving unlimited wealth!